The Pattern System is a breakthrough in understanding personality that is oriented toward psychological healing and personal growth, created by Jay Earley, PhD. The Pattern System also helps you to understand other people—why they respond as they do, what makes them tick. 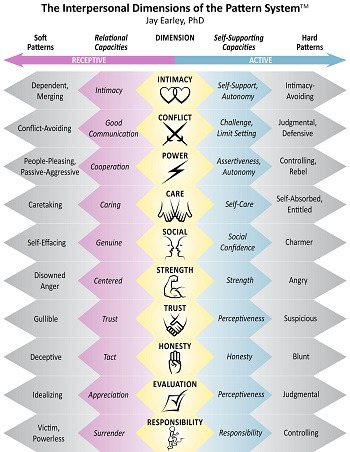 It gives you a much more detailed understanding of yourself than other personality systems. Browse the Pattern System. Check out the three groups of dimensions and browse though their patterns and capacities. Check out these articles, books, quizzes, videos, and other resources on the Pattern System. Introduction to the Pattern System. A comprehensive article introducing the Pattern System. Pattern System Quizzes. A variety of quizzes, including quizzes to help you determine which patterns and wounds you have and which capacities you need to develop, and quizzes on specific psychological issues. These quizzes cover those patterns and capacities that you can work on in Self-Therapy Journey. Watch these two videos that introduce the Pattern System.